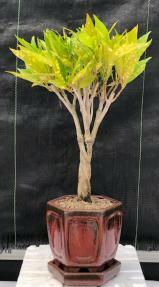 This impressive, trouble-free Gold flecked tree is native to South Florida and simply loves balance in everything. This tropical tree displays probably the best colors in cool, but not in freezing or hot locations, adequate amounts of watering and indirect sunlight. Multiple trees are fused together to form the trunk of this very unique tropical tree. Recommended for home office or dorm with moderate lighting conditions. Very easy care. 12 years old, approximately 20"-21" tall.